The broad excellence of UCLA Mattel Children's Hospital is recognized in the annual Best Children’s Hospital ranking published today by U.S. News & World Report. Two pediatric specialties — nephrology and orthopaedics — placed in the top 20 nationally, and six others earned spots in the top 50. 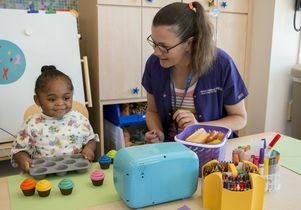 “These rankings reflect both the outstanding care that UCLA provides to children with a wide range of conditions and UCLA’s national standing in pediatric care,” said Dr. Sherin Devaskar, physician-in-chief of UCLA Mattel Children’s Hospital and the Mattel Executive Endowed Chair of the department of pediatrics. Presented by Harry Winston, the festive gala honored Alexandra and Sean Parker for their philanthropic leadership, Gwyneth Paltrow for her advocacy of healthy living and 12-year-old Kaiis Davis Jarrahy for his courage. Then, at evening’s end, “Coldplay” frontman Chris Martin closed the gala with a surprise performance. UCLA Mattel Children’s Hospital has been recognized for excellence in all 10 specialties measured in the 2016-2017 Best Children’s Hospital rankings published by U.S. News and World Report. Two programs placed in the top 20 nationally – nephrology (8) and orthopedics (19). Also ranked were endocrinology (21), cardiology (25), gastroenterology (25), cancer (26), neurology/neurosurgery (31), urology (32), neonatology (37) and pulmonology (39). UCLA Mattel Children’s Hospital is a recognized leader in pediatric surgery and an international referral center for a variety of specialized treatments. Surgeons at Mattel have pioneered the most successful techniques available for repairing pectus excavatum (or “sunken chest syndrome”) in adolescents and have led the charge against childhood obesity with novel gastric bypass surgery for extreme cases. In fact, Mattel has an entire surgical wing dedicated to patients undergoing minimally invasive laparoscopic surgeries. Pediatric patients at UCLA Mattel Children’s Hospital benefit from unique technologically-advanced treatments – including robotic telemedicine. Collectively, the hospitals that comprise UCLA Health System rank among the top five health care systems in the U.S.
15 UCLA residency programs rated among 10 best in western U.S.